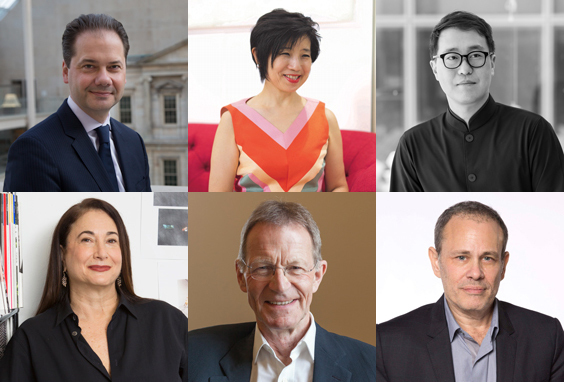 The 2019 Nomura Art Award Jury: Max Hollein, Yuko Hasegawa, Doryun Chong, Kathy Halbreich, Allan Schwartzman, and Nicholas Serota. Photo: Nomura Holdings, Inc.
Nomura Holdings, Inc., a Japanese financial services group, announced today that it has established a $1 million prize for contemporary art, making it the largest monetary award in the industry. The annual Nomura Art Award will recognize an artist who has “created a body of work of major cultural significance.” The inaugural prize winner will be announced in October. The accolade, whose amount far surpasses those of the contemporary art world’s most prestigious prizesincluding the Turner Prize, which is only $33,000; the Hugo Boss and Future Generation Prizes, which both award $100,000; and ArtPrize, which gives out up to $200,000 to individual artistswas conceived to help an established artist realize an ambitious project. In addition, the company, which is headquartered in Tokyo, will present two annual emerging artist awards that will each have a purse of $100,000. The recipients of these prizes will be revealed at a press conference in Kyoto on March 21. Commenting on the prize, Allan Schwartzman, the founder and principal of Art Agency, Partners and chairman of the Fine Arts Division of Sotheby’s, told Artforum that the initiative was born out of the company’s desire to support the arts in a meaningful and innovative way. Nomura first approached Sotheby’s about a year ago and asked the auction house to advise on how to launch the award. Schwartzman will serve on the 2019 prize’s jury alongside Doryun Chong, deputy director, curatorial, and chief curator at M+ in Hong Kong; Kathy Halbreich, executive director of the Robert Rauschenberg Foundation; Yuko Hasegawa, artistic director of the Museum of Contemporary Art, Tokyo; Max Hollein, director of the Metropolitan Museum of Art; and Nicholas Serota, chair of Arts Council England. The late curator, critic, and author Okwui Enwezor, who passed away last week, was also asked to be on the jury. Founded in 1925 by Tokushichi Nomura II, the first son of a money changer in Osaka, Nomura is the largest retail network in Japan and was the first Japanese company to become a member of the New York Stock Exchange in 1981. According to the company, Tokushichi Nomura II was an avid practitioner of the tea ceremony and supporter of Noh theater. The award was, in part, created in honor of his spirit as well as to further the company’s engagement with the arts. It is cosponsored by Nomura Research Institute, Ltd. and Nomura Real Estate Holdings, Inc.